Christian Nesvadba was born to paint. His eye for color, movement, and mood are exquisite, and his riotous Impressionist flowers are only the beginning to receive the attention they merit. His first major award was the prestigious SalzBurger Kulturfonds Prize, earned in 1997 when the artist was just twenty years old. Two one-man shows in Salzberg (premiere) and in Linz followed in 1998. He enjoyed a One-Man Exhibition at the Galerie Opernring in Vienna in 1999, and his US debut at the NY Art Expo 2000. All of this happened before he was even twenty-three years old. Clearly, this is a prodigious talent that will only continue to grow in his craft. Nesvadba was born in 1977 in Vienna, son and grandson of successful painters. His father, the celebrated landscape artist Gerhard Nesvadba was his first tutor. The boy's gift was recognized early, and after starting at regular school, he was transferred to one that specialized in drawing and engineering. But these fields were too rigid; too technical for the emerging artist who was finding his own voice after learning everything he could from his father. The artist travels extensively, photographing flowers in every light, every season, every arrangement. He doesn't copy from his photos, but uses them to springboard into his own brilliantly Expressionist world, where function fuses with form and color is everything. Nesvadba's paintings nearly explode with color and light. His cobalt blues are in sharp contrast with his bright, fiery reds and starling yellows, casually arranged against beds of cooler greens. These are not precise botanicals, but bold, vibrant statements of life that will continue to be extremely collectable. 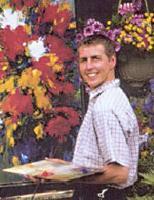 Tragically, Christian Nesvadba died in a car wreck October 2008.